Calia Read just released a PSYCH THRILLER just for me!!!! That one up there to the left. YAY!!! Er… no. Well, not just for me, but I like to pretend. 😉 Figure Eight IS LIVE!! AND OH BOY BLURB-JOLT STALKER ALERT!!!!!! OMG this blurb (the whole thing!! ), but especially the last part. “But there’s no one that can compare to me. You seem to forget that I’m your figure 8. Your infinity. You try to run, but I will always find you.” P.S. It’s even super-bargain priced right now. Santino Hassell just released his latest M/M book (Insight (The Community Book 1), and Fabi, Teri, Molly and Kandace are our resident Santino fans!!! I hear he’s AWESOME. 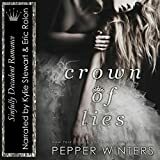 Pepper Winters has a new audiobook too!! Crown of Lies: Truth and Lies Duet, Book 1 <— JUST WENT LIVE!!! I will always consider this one of my absolute FAVORITE covers (so gorgeous! ), and I hear this series is good and dark! Alexandra Bracken‘s “Darkest Minds, The” is being made into a movie!! Tasha found us this good news and the article (Mandy Moore has been cast, and shooting for it is in Georgia, starting mid-March)! “My fabulous and gifted friends have kindly chosen to support me in raising funds to develop The Breathing Series into ten movie-length episodes, to be released on a cable/digital television network. They have all donated signed books to be auctioned for this endeavor. My heart is full from the support, love and generosity I’ve received from my friends. I am so grateful to have such wonderful women in my life! Amy Harmon just announced the title and posted the blurb of her upcoming release (the sequel to her HUGE hit “The Bird and the Sword“) called The Queen and the Cure. The cover reveal will be in April (and it will release in May!! ), but you’ll get a good feel for it, with this blurb! Colleen Hoover has posted a mini “FAQ” on her upcoming TV show series for her book Confess: A Novel, so if you’ve had questions… like… “What’s Go90?” (where it will be airing), she’s got your answers! P.S. Here’s the trailer!!! “Crump says they have another week of pre-production here before they begin actually shooting the film a week from today. They’ll then film for ten days in Madison, Georgia before finishing in Los Angeles. So, let me settle in and tell you all about what you should read. Figure Eight looks good and Don’t Hold Back looks marmyish (and good too)! I can’t believe Madeline Sheehan is FINALLY releasing the next book in that series! It’s been so long! So your mom read the Maryse and peanuts post?? You and your mom should do a road trip to RT. Pick up blog readers on the way. That would be a cool spin off. Eek :-/ There’s no way I could read Don’t Hold Back. I nearly started to choke up just reading the mini blurb up there. I love the book of Hollywood Dirt so It will be interesting to see how well it carries over into a film. Hey! I didn’t know Working It was coming out so soon. Thanks! I love that cover Amy! Keep us updated if you read it! Did I tell you I’m just finishing up Cruel and Beautiful? It’s you, right? That loved it so much? Ooooh this author is sneaky!!!!! And so good. Genius, even. Maryse I just finished an absolutely best read and I don’t think I’ve seen it on your blog. The Copper Smith Farm House by Devney Perry. Couldn’t put it down!!! I’m actually pouting because I wish I could read it all over again for the first time!!! Anticipating a snowstorm here in the panhandle of WV so maybe snuggled in with another great book!! Hello? Ms. Sheehan… um… could you wrap up the Un- series & get back to Holy Trinity FOR CRYING OUT LOUD! There should be a rule about “trinitys” – must complete within 36 months or less. My wait is becoming Gabaldonish. I’m almost done with Weaving Man. Hands down one of the best books I’ve ever read & best male characters ever. Complicated, intelligent, cunning, tender, loyal, ruthless when he needs to be. Stunning debut from this author. I’ve been saviring it for a while now. Don’t want it to end. I’ve got 10% left & already mourning leaving their world.! OMG Maryse…I didn’t know you were reading it!!!! Right there with ya MichelleS…no more Un- books for crying out loud!! You can’t kick the sh!t out of my heart like she did at the end of the second Trinity book and book 2.5 and then just leave me to wallow in my misery, dammit! I’m going to have to re-read the whole freaking 2.5 books just to remember where we left off! Ugh. Just like Monning & the Fever series. You’re losing me, authors! Ooh Copper Smith Farm House looks good. Thanks Linda.